OT - I am … I am… RETIRED!! 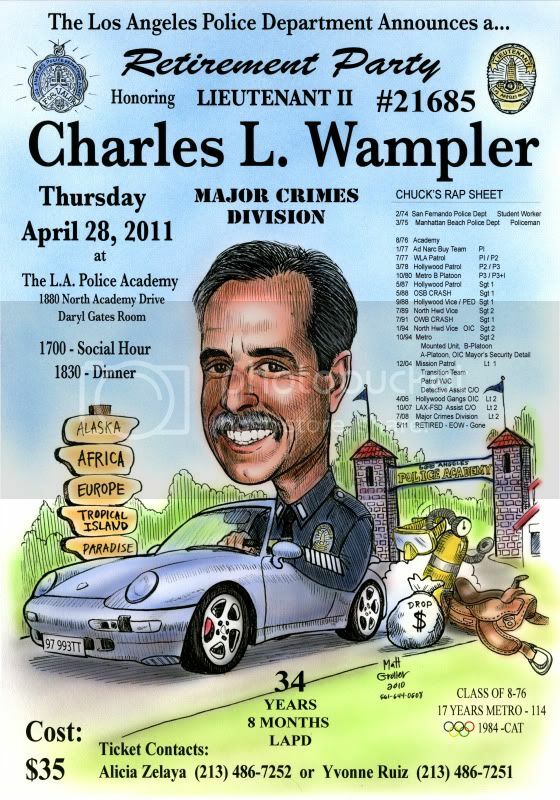 After 34 years 8 months with LAPD, I am officially RETIRED. I had a great career, worked with some great people, some great assignments and have some great memories. I purposely transferred often and worked a variety of assignments. I loved working the streets. The last couple years I worked as a Lieutenant in Major Crimes Division. I had some opportunities few officers get to experience. I worked three gang assignments, worked Hollywood Vice, rode horses for three years; I was the Officer-in-Charge of the security detail for the Mayor of Los Angeles. One of the details with the Mayor took me to Asia for eleven days. Another took me the Super Bowl in New Orleans where (while watching the Mayor) I sat in the NFL sky box at the 50 yard line and watched the game. I spent 17 years assigned to Metropolitan Division as both an officer and a sergeant. Metro is a specialized Division that it very selective in who works there. The Division houses two crimes suppression platoon, SWAT, K-9, the Mounted Unit and a dignitary protection section. As a young officer I stood post outside President Reagan’s suite with SSA Timothy McCarthy. He had just returned to work after recovering from being shot while shielding the President from being by Hinckley. I spoke with him for hours; what a man and a class act. I also was fortunate enough to work a Counter Assault Team during the 1984 Olympics and was assigned to UCLA where the Olympians were housed. I have been proud of my profession. I have also hung my head in shame over the behavior of some of my peers. I have come to the conclusion over the years that as long as Police Departments hire from the human race there will be problems. I have had some of the brightest people work for me. Medical Doctors have become officers. Lawyers have become officers. I met one young officer that graduated from Berkeley School of Law at Boalt Hall and joined our Department. And, I have met ones that I could not figure out how they filled out the application or passed an oral interview. I have attempted to convince people I have met to join the LAPD. And, I have tried to get officers to sign resignation forms. I have been married to the same lovely woman for over 34 years. We have four grown kids and three grandkids. Next….. Lots! We’ll spoil our grandkids. Our home is on horse property and we have two horses. We love to ride and have miles of trails in our back yard. I will landscape the heck out of my property. Travel… Travel … and more travel. We fly out Sunday for ten days in the South Pacific (Cebu in the Philippians) for a SCUBA trip. My son is sending us to Europe in September for three weeks as a retirement gift. His Berkeley degree in computer science has paid off; www.upsellit.com. Next year will be Alaska and Africa and another dive trip. And the Porsche will play a role in keeping me busy. I am going to drive up to Monterey in October for the three day 2011 Porsche Rennsport Reunion IV. The 993tt may have 41,000 miles on it now, but in five years it will be substantially higher! Sorry for the OT….. But I need to share! I get to be the first to say CONGRATS! I hope you have a long and enjoyable (w/ lots of Porsche 993 events) retirement! You will now be able to dedicate yourself full time as the 993 Audio Consultant! Congratulations, Chuck! Thank you for your service to the community, and all the very best to you as you begin to enjoy the fruits of your years of labor. Thank you for your many years of service. You had a very full career and it doesn't sound like you will be slowing down anytime soon! Enjoy these years with your lovely bride. Congrats Chuck and I believe you threatened to visit Andreas and I when you retired. Congratulations and thanks for a job well done. Chuck. Great career, great family, great retirement, great guy. Have fun. I LOVE being retired. Chuck-- Thanks for your service, often in harm's way. Awesome that you took the time to share your distinguished career highlights with Rennlist friends. Fun to read of your plans, & your pride in your family. Congratulations on all you've done, & all ahead of you! Most of all thank you for your service. Enjoy the traveling, it's absolutely great when you can do it without hurrying or having your head full of work stuff. Congrats Chuck! Now you have the time to take a road trip on that Turbo. If you come by the east coast, visit us folks in Georgia. This is great news!! I enjoyed reading this post. To Sum up your career in a few paragraphs must have been tough to do but again I enjoyed reading it, a lot to be proud of!! I've also enjoyed meeting you and chatting about the service you've provided over the years!! Well done and I am one who is proud to know you. Congrats! And about that SCUBA trip to the south Pacific -- I hate you!!! Do you shave off the obligatory LEO mustache now that you are retired? Quick Reply: OT - I am … I am… RETIRED! !